Looking for in-person FERS Retirement Seminars in Alaska? Shilanski & Associates, Inc. offers live, in-person FERS retirement classes in Anchorage, Alaska. At our full-day workshop, you will learn about your FERS retirement benefits and what you need to consider before retiring from the Federal Government. Our April 3 and April 4 classes in Anchorage have sold out. 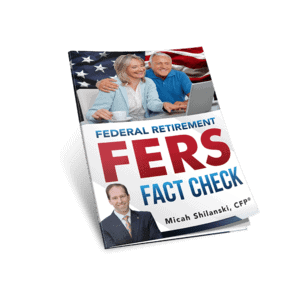 If you’d like to know when we offer classes in the future – be sure to sign up for our monthly ezine, “FERS Federal Retirement Fact Check”. When you’re signed up for our ezine newsletter, you’ll get the latest information about classes we teach. We can teach a special class for your agency. Request a class for your agency by filling out this form. We also have a new exclusive online workshop for FERS federal employees. It’s called “3 Critical Concepts That Most Federal Employees Miss When Planning Their Retirement”. This workshop is only offered a few times a year. Sign up for our ezine newsletter to find out when we start our next class. Before you sign up for a pre-retirement class, make sure you know who’s teaching your class. Many instructors teaching pre-retirement classes fly around the country teaching classes. But very few have actual experience helping individual federal employees plan their retirement. Our FERS pre-retirement classes are taught by Floyd Shilanski, Micah Shilanski and Jamie Shilanski. Each are financial professionals living and working in Alaska. They help Federal Employees in Alaska and federal employees from across the nation to plan their retirement. They have real experience in helping individual federal employees through the entire retirement process and beyond. Floyd is the founder of Shilanski & Associates, Inc., an independent financial planning firm that has been in business in Anchorage for nearly 40 years. Floyd has years of experience helping individuals pursue their financial and retirement goals. Micah is the founder of Plan-Your-Federal-Retirement.com. He is also an author for FedSmith.com, and has been mentioned in many GovExec.com articles by Tammy Flanagan. Federal Employees from across the nation (and even those stationed overseas) have called Micah when they needed help with their federal retirement benefits. Micah is a CERTIFIED FINANCIAL PLANNER™ professional who specializes in helping federal employees get the most out of their retirement benefits. Jamie orchestrates educational classes as well for Federal Employees working in the State of Alaska on their benefits. She works with several Human Resource professionals in an effort to educate employees on how their benefits play a significant part of one’s financial plan. Your federal benefits are just one piece of your overall financial puzzle. Our FERS retirement seminars are provided at no cost to federal employees, but you must register online in advance. Parking is at your own expense, so we encourage you to bring a friend and carpool. We think it’s important for you to be able to ask questions during the presentation, so we keep our class sizes small. Registration is first come, first serve. Classes start at 8:00 am. Our FERS retirement seminars are generally concluded by 5:00pm. We’ll go over the ins and outs of your FERS benefits, but we also discuss how your FERS benefits fit into your overall retirement picture. We encourage Q&A for each topic. Throughout the day, we’ll share stories about common mistakes we see and how to avoid them. Depending on the audience, we can go more in depth on certain topics as needed. Want a Special Class Just for Your Federal Agency? Our full-day workshops are for FERS from any Federal Agency. But what if you’d like us to come and teach a special class just to your Federal Agency? We have taught specialized classes for several Federal Agencies in Alaska. Custom classes can be tailored to fit your time and content requirements. Find out more about custom classes for your agency.